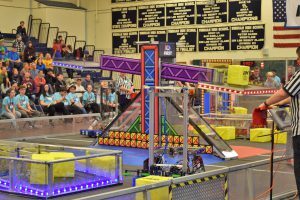 Over the weekend of March 2 & 3, Team Phoenix competed in our first official competition of the 2018 season, the NE District Granite State Event. We made it into 8th place out of 35 teams during the qualifying matches, making Team Phoenix the captain of an alliance during the playoffs. We joined forces with teams 1073 and 5686, though we were ultimately eliminated in the quarterfinals. There’s more to each competition than the robot game, though. At the end of the weekend, judges present awards to teams for exceptional performance at specific parts of the FRC mission. At the Granite State competition, we took home two major awards: the Entrepreneurship Award, in recognition of our innovative student-run structure, and the Safety Award, for our team’s efforts to promote safety among both our students and other teams. Each of these awards gives us points towards qualifying for the New England district championships, supplementing our robot’s performance. We’re currently ranked #19 regionally out of over 200 teams, subject to change as the six-week competition season continues. If we remain in the top 28, we can expect to be invited to the district championships. Our next competition, the NE District Greater Boston Event, is just under a month away. Team Phoenix again invites you to visit, whether to learn more about FRC and the team or to watch the competition. Revere High School, Revere, MA Periods of interest in the schedule are italicized for your convenience. Armed with the lessons learned from the competition, we’re excited to push forward into the rest of the season. We hope to see you in Revere! To learn more about the awards we won and how we won them, check out our website at content.team2342.org/awards. For a brief taste of the competition, watch one of our matches here. Our robot has red bumpers, with the number 2342 stenciled on them.